Praise the Lord. If you want you may look in your Bible to the 20th Chapter of Acts. You know, I was just thinking while we were singing here today, when I get on a big airplane to fly and I come in through the door and the cockpit for the pilot is on my left and the pilot is almost always sitting there already waiting. I don’t usually see the man’s face, but I see the back of his head and if I see gray hair I feel good because I know he is an experienced (elder) pilot. I’m sure he has been in trouble before, he has lived and he has come through it. Amen. Do you remember the pilot that landed the airplane in the Hudson River by New York City? Birds got in the engine. It is most unusual that he could land that airplane in the river and it didn’t sink. So God has a purpose for elders in the church, in the natural and in the spiritual. Amen. Now in the 20th Chapter of Acts Paul is finishing his missionary journey in this particular area where he had been traveling and ministring. He is on his way back to Jerusalem. He will not come back to these cities again. He will write to them, but he is going to be bound in Jerusalem and he is going to be sent to Rome. So since he is the man that planted the seed in these churches, he laid the foundation and he set the churches in order. Sometimes he sent Timothy to help him put things in order and at one point he said to Timothy to go to the church and to recognize the elders and to set the order. He didn’t say anything about setting Pastors in the church, he just said to set the elders in order. That’s verse 17. Does your Bible say the same thing? Amen. So we are in agreement. Now he is giving them his last word. He is giving them the Word he believes to be most important for the church. In verse 28 I am going to show you that Paul is saying. I just read the 1st half of verse 28. Now remember he has called the presbuteros, the elders. To them he is saying, “take heed…unto yourselves, and to all the flock” which is the sheep, the poimnion. “Over which the Holy Ghost hath made you overseers”, episkopos, overseers, not bishops. That is the same word that the bible translators put as “bishop” in some other places. Ephesus wouldn’t have that many of what the church today calls bishops. So Paul is saying that the elders are the overseers overseeing the sheep, the flock. Who made them to be overseers? How did they get that job? What does it say? The Holy Spirit appointed them to be overseers. You see, God sees into the hearts of men. God puts these gifts into men. God sees faithfulness. God sees maturity. You know there are some men who are not responsible. I’m sure you know men like this? They promise you that they are going to be at a certain place at a certain time to do a certain job – and they don’t come and they don’t do it. Maybe they are forty, maybe they are fifty years old, but they are still like a child. Sometimes God sees men that are only thirty, but they are faithful: always faithful; keeping their word; making a promise and keeping their word. This is the way we deal with our spouses our marriages; we are faithful. So this quality trait of life carries over into everything that we do. “Feed” is poimainowhich means to see that the sheep have good pasture, good food to eat. The shepherd doesn’t have to pick the grass and put it in the sheep’s mouth, all he has to do is to take them to the good pasture, present the food and the sheep know how to eat. And if they are sheep, they will eat the proper food that is presented to them. So again, what we see here is the responsibility of the elders to shepherd sheep. Amen. Elders shepherd sheep and elders oversee the flock. They don’t just feed sheep, but they are also watching. As they are watching the flock, sometimes they see sheep that need to be healed, wounds that need to be bound up; one sheep didn’t get enough food, give some special attention to this one. But in watching, you are also watching for wolves. Now these wolves will not come looking like wolves, they will come looking like sheep. But the responsibility of the elders (plural) is to spot the wolf and confront the wolf. So we see the shepherd ministry is pretty well defined already, isn’t it? Can we go to the book of Ephesians? We do want to look at ministry. You probably have heard so much about what went wrong in the church systems that you would like to know what is right. We need to hear the positive of what is right. So the first positive is that God wants elders to take responsibility among the flock. Amen. That is a very good thing. Some of you are Pastors, this word is not meant to say that you have no place in the church. You will have a very important part in the church, but you won’t be calling yourself Pastor and you won’t be acting like the Lord over the flock. Now I am talking so far about the local fellowship, but God also has ministries that reach out beyond the local fellowship and of course these ministries are also part of a local fellowship. Now when I say ministry, here is another one of those words that got corrupted over the years. The original meaning of the word ministry means servant. But when I drive the streets of Addis Ababa I see: Ministry of Water; Ministry of Education; Ministry of …; all kinds of ministries of government. So you see from the word servant it has come to be the head man, the chief man. So the word has changed its meaning, but if you will understand me when I am using the original meaning of the word ministry I really don’t have a better word to use. We will talk about five-fold ministry. So these ministries are gifts that God has given to the church. When I say “church” I mean the “true church”, another word that has unfortunately changed in its meaning over the years. So many times when we say “church” we are talking about the whole system of churches, but I am going to use the word that God intended to have – HIS CHURCH. All right, so He gave these gifts. Somebody was telling me here in the beginning of the meeting that they have a friend or man or somebody that they know. He gave them a card or something with his name and it said: “Apostle Doctor” or something like that – “Doctor Apostle”. By the way, I think I have only known one real apostle in my life. However, I do believe that God has more of them. I have read a couple of wonderful books about men that I believe with all my hearts are true apostles of God. I don’t know how many He has. I don’t know if I will ever meet another apostle. I will say this: there aren’t very many of them. Going and getting a Doctoral Degree in Theology, printing a calling card with a title and traveling on the road does not make you an apostle. You can even plant two or three churches and that does not make you an apostle. Amen. Now the word apostle means sent, men who were sent. Brother Burt told you the other day how Paul came and submitted himself to the local fellowship. The Spirit of God began to move when they fasted and prayed and the spirit of prophecy came to the people there. We know there were prophets in that fellowship as well. 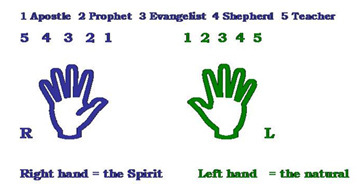 The spirit of prophesy said: “Separate Paul and Barnabas unto me,” and they laid hands on them and sent them out. Now we are sent of God. We who came here are sent here of God, but not one of us would say that we are an apostle. We may have other gifts, but we don’t have the apostle gift, but what we are bringing you is an apostolic Word. We bring an apostolic vision to you and we have been influenced by the ministry of an apostolic Word. We have been taught by an apostolic Word. Paul said to Timothy to find more faithful men and pass the word on to them. The second ministry gift is the prophet. If I had time to draw the sides of the boards of the tabernacle building itself, the wooden boards that were covered with gold, the boards that speak of members of the body and these boards had golden rings and there were five bars that went through that held the boards and kept them in order. [See illustration below]. This is the function of the five-fold ministry, to keep the church in order so that we don’t go off on some strange doctrine, so that we don’t listen to some wolf. There are many deceptive ministries where I come from leading many, many people astray. Some of them have BIG television programs. Sometimes a whole church under a Pastor will go down and travel to be a part of this – whatever is going on. But you see, if these churches had access to the full five-fold ministry of God they would not be deceived like this. They would have a solid doctrine that is in agreement with the Word of God. So the bar in the middle goes all the way across, which is the apostle bar. Then there are the two on the top, the prophet and the evangelist. And there are two bars on the bottom, the shepherd and the teacher. Now you know the ministry of the prophet. I don’t have to talk to you a lot about that do I? You believe in the legitimacy of the prophetic ministry, do you not? You know the interesting thing about (shall we say) the world of churches, is that most of the churches that are not in God’s order, do not receive the ministry of the apostle; and they do not receive the ministry of the prophet. These are two of the most important ministries, (if I dare use the word important), and they have rejected by the churches. If they have apostles they have corrupted the meaning of it and they have probably appointed themselves. Brother Burt Asbill: I would like to add a comment with regards to the apostle and the prophetic ministry, is that scripture states that the foundation of the church is established on those ministries. Brother Mark: Yes, I was going to mention that. Thank you Burt. The foundation of the church is based on the ministry of the apostles and the prophets (Eph 2:20). Brother George Herrig: A second witness is 1 Corinthians 12:28. The man was living in sin and he fell down and admitted his sin. Now would we rebuke that little girl? Do you know what, these big ministries, these big television ministries; you cannot get close to them. They have twelve security guards around the platform. If you come close to that platform one of these security guards will grab you and take you out. How will you know them that labor among you if you can’t meet them or even talk with them? I’m just telling you – Jesus said that many will rise up and say that “I am of the nature of Christ”. He said, “Do not go after them and do not follow them.” The church apparently has forgotten to read what Jesus said because they go after everything that comes. Come on, brethren, we have to start overseeing and watching the flock to see that this thing doesn’t come in to the house of God. When we first heard the man that I am talking about in my experience, he came to our local fellowship. He said many powerful things that shook us up. I didn’t quarrel with her. I put my head down and I said, “O God, I need to repent. I’ve got to get rid of that wood, hay and stubble that I have been involved with, because it will be burnt if I bring it before the judgment seat of Jesus Christ. One of my fingers (the middle one) is longer than the others. Can you see which one? One of the ministries reaches out quite far. The evangelist ministry goes out to many places. Now I don’t know that Timothy was an evangelist, I don’t believe that he was. But Paul said to Timothy, “…Do the work of the evangelist...” (2Ti 4:5). So you don’t have to be an evangelist to do the work of an evangelist. You don’t have to be a prophet to prophesy. Not everyone that prophesies is a prophet. The gift of prophesy is also in the body of Christ. Sometimes a little child will prophesy. So the evangelist is a gift that reaches far out. Like the apostle and the prophet, the evangelist doesn’t have to come and say, “I am John Brown and I am the Evangelist.” If he preaches like an evangelist and he has a concern for reaching out to the lost he might have the gift of an evangelist. Now we have the next finger. I call it the shepherd finger. What do I have on this shepherd finger? What do you see there? You see a golden wedding ring. What is the meaning of that golden ring? It is a ring of covenant of love, is it not? The shepherd has a covenant of love between God and his sheep and he loves the sheep. He lays his life down for the sheep. Jesus is ALL of these ministries? He has it ALL but he parceled it out to men. He didn’t give us all those gifts to one man. Amen. So the LOVE ministry, the shepherd ministry is loving the sheep that are sometimes difficult to love. Have you ever met people that are difficult to love? They just don’t want to be loved, but you love them anyway. When I have trouble loving some people I think of Jesus and I’m thinking that He loves this person. If I am His servant, I am going to have to change my nature and my attitude to be like Jesus. Okay. The last of my fingers, it’s the smallest, the teacher. But let me ask you a question. If I want to get into my ear, which finger would I use? This one works best. So the teacher ministry can get into your ear. Amen. He breaks the word down so that you can digest it, understand it. Now there is one more little subject that I would like to bring up if we have a little time here yet, don’t we? Let me find the page here. Let’s not leave Ephesians 4 right away. Here we are. The purpose of this five-fold ministry and how long is this ministry going to last? It says here He gave these gifts to the church, to the body of Christ until when? Forever? No. Are we all in the unity of the faith yet? I don’t think we are all in the unity yet. There is that word that George was talking about yesterday, the perfect man, complete, mature, lacking nothing. This is many years ago at the time when the iron curtain of Communism came down there. I guess the curtain came down everywhere, didn’t it? So she brought two men over to where we were staying. I greeted them. I said, “But the Word of God says, ‘until we all come…’” and I read that verse. So again, God is describing the ministry as protecting the flock from the deceiving wolves. Let me go to one more place before we leave this. I think we will go to the 23rd Chapter of Matthew. Jesus was talking to the ministers of the church of His generation, the scribes and the Pharisees. Now let me read a few verses here. Now what is the motive here of liking the chief seats and liking the uppermost rooms at the feasts? The motive of this ministry of course is that they want recognition by men. The servant that washes the feet gets no recognition of men. The man that opens the door or the gate doesn’t have a very important place of recognition. But if he doesn’t open the door I can’t get in. They bow a little bit you know and I have noticed that the priest enjoys this. He smiles and you know that he likes the recognition. Jesus was saying the same thing in His day. The Rabbi wanted people to recognize that he was a Rabbi in the market place. It has nothing to do with his spiritual place of teaching the word. He just wants the personal recognition of honor. I mentioned that when I first went to the city where I live there was a Pentecostal Church, it was part of a denomination and it was the biggest church one in town. One night after a meeting we went to a certain little restaurant in the city. I knew some of the Assistant Pastors that this man had. I thought I saw one of the young men sitting at another table, but I was confused because he had the black shirt with the little white trim at his collar. Then I thought, “Well maybe he is an Episcopal priest.” So finally my curiosity got the best of me and I got up from my table and I walked over to the table where this man was sitting. What is Jesus saying? Come on, help me to put this into terms that we can understand. Are there any Rabbi’s here today? No, I don’t see any Rabbis. Is this verse talking to us? Can we just cross it out and say that it doesn’t apply to us? Throw it away that it has no meaning to the church? If you want to put that on your card – put it on your card. Brother John Jones – but you don’t even have to put Brother. No, I am serious. I called the office of one of the men that I knew; he was a friend of mine. His secretary answered the phone. Oh my goodness. But this is the way some of the Pastors insist that people call them. New people come to our fellowship, people that I’ve never seen before. “One is your Master” – now the word master has a meaning. It means the chief teacher, the one who is in control of the classroom. By the way, I met the Master one day face to face. Jesus stood before me when I was in a hospital bed and I saw His face. He had the face of a Master and He was not happy. He told me some things that were going on in the body of Christ. I know who it was. I saw His hands. I know HE was the Master. He didn’t have to tell me anything. I knew the Master. So you see, the kingdom of God is in reverse order of the kingdoms of this world. So when they said that Paul turned the world upside down, he was putting it right, the right way that it should have been. Amen.